If you haven’t seen Adele live in concert, don’t worry: soon, you’ll be able to catch her in your own time and space. 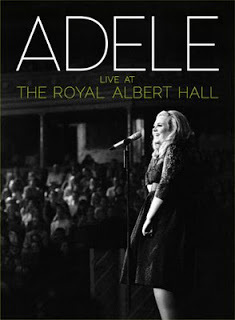 Adele will release “Live At The Royal Albert Hall" on DVD and Blu-ray on November 29. "Live At The Royal Albert Hall" features the full 90-minute performance, plus behind the scenes footage shot throughout the day of the show. The package also contains an exclusive live CD of the entire concert. This project marks the first time fans will be able to hear all of Adele's hits and best loved songs on one CD, plus her stunning covers of Bonnie Raitt's "I Can't Make You Love Me" and The Steeldrivers' "If It Hadn't Been For Love." It has been an incredible year for Adele, starting with her #1 album "21," her #1 single "Someone Like You," the global smash "Rolling In The Deep" and her live appearance on The Brits. Her album "21" has become the biggest selling album in the world this year - 12 million copies sold and counting - with "21" and "19" remaining the UK's 1st and 2nd highest-selling albums so far in 2011. "Live At Royal Albert Hall"